Home / Tips and Care / ROSE COLORS AND THEIR MEANINGS. HOW TO CHOOSE THE RIGHT ONE! It’s no secret that receiving flowers can make you feel special. In fact, approximately 65% of Americans reported feeling just that when they received flowers as a gift. But there’s more than just the occasion that goes into selecting the perfect flowers. Playing into the five human senses, how a floral arrangement looks actually has a pretty big impact on how it’s received. If you want to make sure you’re giving the perfect gift in terms of flowers, here’s a short guide to help you choose the right color for your special occasion. Red: Traditionally associated with romantic occasions like Valentine’s Day, and for good reason. 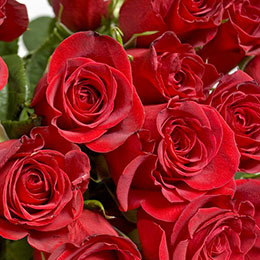 This color represents love, passion, and romance for whoever is receiving the arrangement. Orange: Typically included in springtime and summer arrangements. This color signifies passion, joy, and adventure. Perfect for a summer celebration! Yellow: Typically found in sympathy arrangements, but it doesn’t signify sadness. In fact, yellow arrangements are put together to send a message of friendship and support to those receiving them. Yellow is also popular for Easter Flowers. Pink: Usually can be great accents to red or white flowers, but standing alone they are symbols of playfulness and gentle romance. White: Traditionally represents innocence and purity. In addition, white can signify honesty and love. White flowers are beautiful for any occasion, especially those occurring in the spring. Blue: Science has proven that blue is a calming color, and the same holds true for blue flowers. Blue arrangements are symbols of calm, tranquility, and balance. Green: Invokes a sense of connection to nature. Like blue, green floral arrangements can promote balance, as well as tranquility. There are countless types of arrangements that florists can help you put together, but it’s always good to have an idea of what certain colors and flowers traditionally symbolize. Florists can offer you some beautiful ideas and history about each flower, but doing your own research may yield even more interesting results. So the next time you need to give a bouquet, don’t forget to consider what those flowers might mean. Contact our skilled florists today at (703)-754-1200 or order online and select same day delivery!